Interactive Whiteboard Ideas is hosting a linky party on ways to use Tagxedo in the classroom. Tagxedo is a lot like Wordle, except it can do more things. I made an example Tagxedo using nouns. I thought this would be a fun way for students to demonstrate their knowledge of the parts of speech. Another use might be listing things they like as a getting to know you activity. SUCH a good idea! I think with my upper grades I'll use it as a quiz--have them list a certain amount. I will be teaching second grade this year. I love the idea of using this as a getting to know you activity. 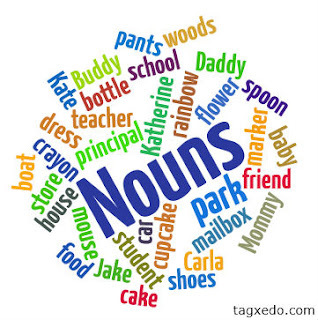 Maybe on the Meet and Greet with parents, I will ask parents to give me some adjectives to describe their child and create one for each child, then let the kids make the noun and verb ones throughout the year?? ?.....just a thought. THANK YOU for sharing!!!!! !